At the start of your Main Phase 1: Banish 3 or 6 random face-down cards from your Extra Deck, face-down; draw 1 card for every 3 cards banished. For the rest of this turn after this card resolves, you cannot draw any cards by card effects. Pot of Extravagance can be used by any player, especially if you don’t care about your Extra Deck. Extravagance has to be the first card played by you in your first Main Phase, eliminating any abuse of the card from the player. Up to a draw of two depending on how many you want to banish from your Extra Deck, face-down. Can’t draw after this card is played isn’t too bad of a restriction, considering all the ways to add to your hand that are currently in the game. Pendulum decks and Monarch decks this benefits incredibly. Pendulum fuel their Extra Deck, while Monarchs rarely care about their Extra Deck. However, really any deck in the game can play this if they are willing to use some cards in the Extra Deck. Players who care about their Extra Deck could play it like another Upstart Goblin, while players who can manage their Extra Deck well, recover their banished cards, or don’t care about their Extra Deck could play this in 3’s. Pot cards are easy to review. Pot of Extravagance is a Normal Spell that lets you Banish Face-Down up to 6 cards from your Extra Deck to draw 2 cards. Banish 3 lets you only draw 1 card. You have to activate PoE at the start of your Main Phase 1 and then you can’t Draw anything else by effects. Can you still draw if the card or effect are negated? Anyway, every deck should be able to give up 6 cards from their Extra Deck to get the most value from PoE. If not, run Desires, Trade-In, Allure, etc…Even Card of Demise might be a better fit. Pot of Extravagance is not unique anymore, it’s just another option. It’s certainly a good option if you have the resources. Score: 4.5/5 Art: 3/5 Even the artwork isn’t special anymore. Ah, my favorite game from Konami, “What Will Players do to Draw 2 Cards?” with the latest contestant in this game being Pot of Extravagance. Extravagance is a Normal Spell that can only be activated at the start of the Main Phase 1, which is there so you don’t try to get around the downsides of this card too much. Upon activation, you can banish 3 or 6 cards from your Extra Deck face-down to draw 1 card for each. So three cards gets you 1 card and six will get you 2, meaning it won’t really ever be a minus. Banishing face-down prevents abuse so it’s harder to get the banished cards back, which is a good piece of balance here. 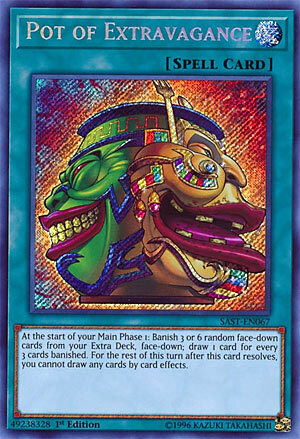 This card is useful in many decks that don’t rely so heavily on their Extra Deck, and they can just throw in multiple copies of toolbox monsters in the Extra Deck just to have them for either summoning, or banishing for this. The cards are banished at random I should mention, so you can’t just banish the least useful cards. After this card resolves, you cannot draw cards for the rest of the turn via card effects, meaning no other generic draw cards like Pot of Desires or Card of Demise maybe. I feel all the restrictions on this card are great for balancing purposes so it isn’t too overpowered considering a lot of decks don’t use their Extra Deck as much as others, so this would of been possibly overpowered in those decks without the restrictions. The card is still great, but it is well balanced to prevent it from being too good. Art: 3.5/5 Mixing Pot of Greed with another Pot is standard nowadays it seems, I don’t think there are other pots left for him to mix with anymore. The next couple days are Pot days (take that as you will, and that’s a soft clue for Throwback Thursday). Pot of Extravagance is simple enough. You have the option of removing 3 or 6 cards from your Extra Deck from play to Draw 1 card for each 3 cards removed by this effect. So ignoring the actual cards removed for a moment, this is a 1-for-1 if you remove 3, or a +1 if you remove 6. You’re prevented from any Drawing via effect after using this (precisely why this can’t be a Quickplay) I like this card, to a degree. You’re giving up a small amount of cards (3 for a 1-for-1) which is balanced (or 6 for a +1) so the more you’re willing to give up, the more you’re rewarded with. It’s a fair card that helps keep a player honest. And the removal aspect isn’t what it use to be. Said cards are removed face down, which does complicate things, but again, only to a degree. There’s more assets to the remove from game aspect of this game then ever, so anything removed you could get back, even if it just ends up back in your Deck or Graveyard, it’s still a resource you’re (one way or another) getting back. You can’t just play this and hope for the best, but it can do well for a player.